Our wide range of experience with QuickBooks in all kinds of environments gives us know-how that can result in better results at the bottom line. We’re accountants – we know the ropes, and how to keep you off of them! 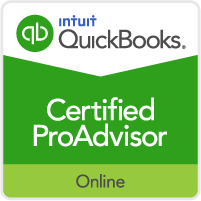 And we’re certified Quickbooks Proadvisors. The biggest mistake a business can make is to neglect the accounting function – it’s the second leading reason for failure (ask us about the first!). The accounting function involves practices and procedures that are designed to give management important financial information needed to run the business. Those practices and procedures are one of your best assets! QuickBooks, if you use it properly, can be a vital part of that. Find the shortest path to the financial information you need to run the business.